Presented in brilliant condition and the subject of a ride to match, last start three-length Maiden winner On the Rocks (3 c Alamosa – Cold Shoulder, by Volksraad) stepped immediately in class to win the $50,000 Trevor Eagle Memorial (Listed, 1500m) on Saturday at Ellerslie, ridden by visiting Victorian jockey Patrick Moloney. Winning a stakes race after only three starts is no easy feat, but On the Rocks accomplished the task in sterling fashion and brought jubilation to his owners: Andrew Clark, David Sinn, Adrian Mathieson, Noel Gurney, Richards Sims, Mount R.S.A Racing Syndicate, Ballymore (NZ), George Alas, Jim Bebedellis, and John McNicholas. The latter three owners struck gold quickly, having only got involved a week earlier. “We owned 50% of Tarzino, so we’ve been looking out for another nice horse and got in last minute with this colt,” Bebedellis said. A $40,000 purchase, he was selected by Paul Moroney, from the draft of Wellfield Stud, at the 2016 New Zealand Bloodstock Select Yearling Sale, a descendant from the same family as Melbourne Cup winner and champion Australian staying horse Efficient (Zabeel). 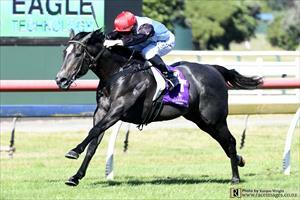 The win continued a good streak for trainers Mike Moroney and Pam Gerard, having had debutant two-year-olds She’s A Thief (Showcasing) and Bocce (Foxwedge) win in the past week, the latter ridden by Moloney a day earlier at Otaki. “It’s been a fantastic trip and a worthwhile trip,” said Moloney, who utilized barrier one and gave On the Rocks a great ride. Trucking in front soon after the start and allowed to steady passing the 1000m, Moloney had his mount striding along beautifully and once balanced to the 300m he quickened to an advantage that proved too great for his rivals. “I was really impressed with the way that he won,” Moloney said. “He’s a horse with plenty of upside and he would have taken a lot of confidence out of the win, being able to do it on his own terms and they couldn’t catch him. A drifter in the market as favourite Demonetization (All Too Hard) continued to capture wads of cash, On the Rocks paid $11.00 & $3.10 fixed odds on the NZ TAB, running the 1500 metres in 1:29.8 and last 600m in 34.6, on Good3 footing. The trainers recently enlisted fellow Victorian jockey Jake Bayliss, who made a fine start in riding nine winners since arriving earlier in November, before being suspended until 3 December, and Moloney flew over to substitute for a couple of meetings. “He’s our stable rider and the decision was made mainly due to the fact that Jake was suspended and we’ve got horses getting ready for important stakes races,” Moroney had said. On the sidelines, but thrilled with the win, Bayliss said: “I’m disappointed to miss out on a stakes ride, but good to see the horse going through the grades and he’s certainly improved since his last win. On the Rocks was strapped by Richie Fallon.